Conductor Leopold Stokowski and the Philadelphia Orchestra join with Disney to create Fantasia, a unique family movie and musical experience. Narrated by Deems Taylor, Fantasia begins with the orchestra arriving and tuning. Then Taylor tells the viewers that there are three types of music: music that tells a definite story, music that paints a series of pictures, and "absolute music" - music that exists for its own sake. Fantasia is a celebration of all three types of music, with eight classical pieces set to the amazing and beautiful Technicolor animations of the Disney artists. The film was a box-office disaster, but it has become one of the most-celebrated Disney Movies in existence. The Toccata and Fugue in D Minor by Johann Sebastian Bach vignette opens with a series of impressions of the conductor and the orchestra. The music begins to suggest colour and vague, abstract forms, which then give way to more substantial forms, culminating in a beautiful, inspiring sunset which fades to black. Chinese Dance: Six red-capped mushrooms suggest Chinese men wearing red coolie hats and dancing. The smallest mushroom cannot keep up with the steps, and his frantic exertions are a perfect counterpoint to the rousing melody. Dance of the Reed Flutes: Colorful flower blossoms dance on air currents until they come to rest on the surface of a stream. There, they are transformed into dancers with billowing skirts. A light breeze disturbs their dance, swirling them across the water's surface and sweeping them over a waterfall. Arabian Dance: Exquisite goldfish with long flowing tails dance a flowing, sensuous dance. Russian Dance: Six thistles in Russian garb dance the high-leaping, high-kicking Cossack dance. More and more thistles join the dance, along with orchids that recall Russian peasant girls with their full skirts and headcoverings. Waltz of the Flowers: The seasons change from autumn into winter as the fairies paint the leaves in gorgeous fall colours and open the milkweed pods to release dancing, spinning seeds that are reminiscent of debutantes in their full, white skirts. Then the Frost Fairies appear, touching the leaves and the surface of a stream with beautiful, lacy frost-patterns. The Frost Fairies are followed by dancing snowflake sprites, which blanket the forest. 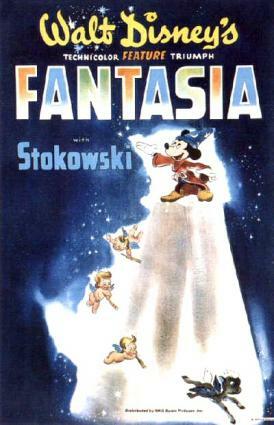 The Sorcerer's Apprentice by Paul Dukas is the best-known segment of Fantasia. Eight minutes long, it tells the story of a magician's lazy apprentice, played by Mickey Mouse. Tired of the drudgery of cleaning and carrying water to fill the large cistern in the cavern with buckets of water from an outdoor fountain, Mickey decides to try his hand at a bit of magic. He puts on his master's conical hat and bewitches his broom to carry water for him while he takes a nap. Mickey is too inexperienced to control the magicked broom, and he cannot make it stop when the cistern overflows and awakens him. He tries to stop the broom by chopping it up, but each splinter magically becomes a full-sized broom and carries on the work of the first broom. It's a vast army of brooms, and Mickey is powerless to stop them. Only the sudden reappearance of the Sorcerer, who uses his powers to part the waters and make all of the brooms vanish, saves Mickey from a watery grave. 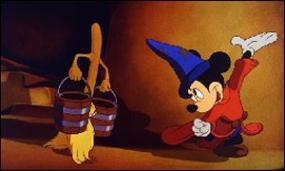 Mickey sheepishly hands the waterlogged magician's hat back to his master, who gives him a solid whack with the broom as Mickey contritely pick up his buckets and returns to his task. "When Igor Stravinsky wrote his ballet The Rite of Spring, his purpose was, in his own words, 'to express primitive life'." So Disney and his animators illustrated the birth pangs of the planet to coordinate with the haunting melodies of Stravinsky's ground-breaking work. First, the viewer sees various images from space: comets, nebulae, stars, and vast black nothingness. Then a planet becomes the focus, and the viewer is drawn down through the atmosphere and hovers over a molten surface, which suddenly begins to roil and convulse as the mountains form and the earth cools. Next, the viewer is plunged beneath the surface of the sea, where life is beginning. Primitive, single-celled organisms give way to more and more complex creatures, until one of them ventures out of the water and onto the dry land. 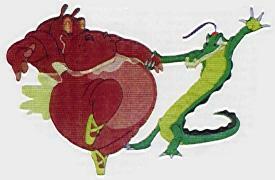 As the music progresses, pterodactyls and other dinosaurs appear. There are great battles among these titans, but soon the earth changes, and they begin to die out as the world becomes a vast desert. The earth returns to a chaos of natural disasters: earthquake, tsunami, and torrential floods as the sun is eclipsed and the music reaches its dramatic climax. During the "intermission," the orchestra has a brief jam session, which is followed by an introduction to the soundtrack. In this whimsical interlude, the soundtrack demonstrates various sounds and gives a rather psychedelic performance as the percussionist tears off a short riff. The Sixth Symphony is illustrated by a lavish treatment of Greek myth, with dancing unicorns and fauns, and a family of soaring winged horses. There is a lovely idyll with the centaurs, clearly a sweet love story aided by romping cupids. And then Bacchus appears, reeling his way across the foothills of Mt. Olympus and inviting everyone to share his tipsy feast. The party ends, however, when Zeus decides to have a bit of fun by staging a violent thunderstorm, chasing Bacchus across the fields with lightning bolts forge by Vulcan. Finally, Zeus tires and the music calms as Iris spreads her rainbow hues across the sky. Apollo, too, is driving his fiery chariot across the skies, and soon the sun sets, revealing Diana the Huntress on the inky black sky. The morning section of this animal ballet features a troupe of ostrich, pirouetting through their morning routine, including a hilarious breakfast ritual. Next is the afternoon. A hippo diva awakens, lingers through her toilette, and then does a lovely dance before falling asleep on a chaise in the courtyard. As evening approaches, a troupe of dancing elephants in evening wear surround the sleeping hippo for their bubble-dance. Night brings the alligators, black-caped and sneaky. In a wild celebration of mayhem, all of the day's dancers join in a whirlwind finale. This piece is terrifying, and most children do not like it. Night falls on Bald Mountain, and all of the evil and wicked spirits appear in a frantic, howling, mad celebration. The peak of the mountain opens up to reveal the lord of evil and death. But he can rule only the night, and after a frightening night's work, the sun rises, and the black god retunrs to his slumber atop the mountain. The final scene in Fantasia begins with a misty morning. A procession of figures is seen making its way toward the cathedral, glowing candles in hand and the beautiful strains of the Ave Maria dispersing all of the terror of the night.